Do you sometimes wonder what type of salt and pepper grinder set your great grandma used? Well, it could be one of these lovely nostalgic retro salt and pepper shakers sets that would look beautiful sitting on your cupboard shelves. 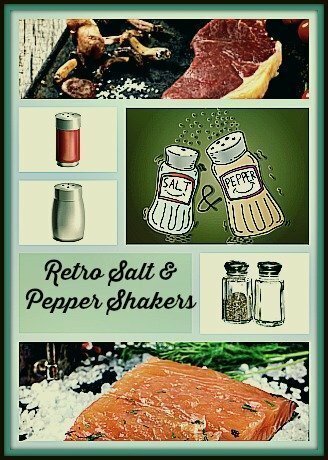 These retro collectible salt and pepper sets make lovely gifts too. Whether as fun Christmas gifts, nostalgic birthday gifts, memorable housewarming gifts, scary Halloween gifts or unique wedding gifts, these old style salt and pepper shaker sets are functional as well as decorative and can bring back fond memories of yesteryears. Whether, ceramic, wood, stainless steel or glass retro salt and pepper shakers, collectors of such items find great joy in displaying such lovely retro salt pepper sets in their homes. You might want to start your collection too after viewing all these lovely nostalgic vintage inspired lovely sets. These would make affordable and fun housewarming gifts too. A touch of cartoon and comic fun magnetic salt and pepper shaker set, this Betty Boop and pudgy shakers sure do look cute and adorable. The shakers feature Betty Boop looking beautiful in her classic short red dress getting a kiss from cute Pudgy. These ceramic shakers would surely be the center of attention sitting on your dining table. They measure 3.5″ in height. A fun retro inspired gift, this diner salt and pepper shaker set is both functional and decorative. Made of ceramic, they measure 3″ W x 2″ H.
Add a touch of old fashioned road side style to your kitchen decor with these shaker sets. Made of ceramic, each shaker bears a tiny Route 66 shield. Do you have nostalgic memories of route 66, the Mother road in America? This jukebox diner salt and pepper shaker makes a wonderful gift for those who love the oldies, who have beautiful memories of route 66. They measure 2″ W x 3″ H.
Unique Salt & Pepper Shakers like these make wonderful gifts! This set of vintage style 8oz glass salt and pepper shakers comes in red translucent glass or clear glass. The screw-on lid is stainless steel, easily removed for hand cleaning. The bottle measures 4.5″ H x 2.75″ W.
The glass bottle doesn’t feel slippery to the touch. This is great as I’ve experienced slippery glass shakers that almost slipped out of my hand into the pot of stew while adding a sprinkle of salt. These are large enough that you don’t have to refill too often. Being translucent glass, it is easy to check on the contents inside each bottle. This is a pair of vintage 50s salt and pepper sets that come in a light blue and green body with shining chrome tops. The holes are shaped into an S or P for easy differentiation. You’ll never ever mix up the salt and pepper again. You fill it up from the bottom part of the shakers. This classic old style stoneware shaker measures 2.25″ L x 2.25″ W x 3.5″ H.
These are ceramic magnetic salt and pepper shakers that always stay together side-by-side. They look real cute retro shakers. The vintage fridge even comes with a written message : Dinner is ready. The stove has the cute message ‘when the smoke alarm goes off’. They measure 4.5″W x 3.75″H. This pair would make a great retro gift for salt and pepper shakers collectors. This is a pair of retro stoneware salt and pepper shaker that you fill up from the bottom. The silver top looks as if it’s screwed on but it is actually a one piece design. You can’t twist it off. Well, an advantage with this design is that you don’t have to worry about the lid dropping off while seasoning your food. These stand at 4″ tall. Painted white with big cursive lettering, these classic salt and pepper shakers add a bit of vintage charm to your kitchen shelf. You can never go wrong with such cute and nostalgic salt and pepper shakers sets as gifts. Collectors of such sets would certainly love these gifts, so would any home chefs.